How do I disable sync from a specific store view in Magento? If your Magento installation has multiple websites, stores, or views, you can disable the data sync from a specific store by following the below instructions. 2. In the panel on the left, select Revenue Conduit tab. You can see the Revenue Conduit settings in the center panel as shown below. 3. In the upper-left corner of a configuration page, set Current Configuration Scope to the website/store for which you want to disable the data sync to all CRM's. 4. Now remove the contents from Revenue Conduit Application Name and Revenue Conduit Store Name text boxes in the center panel. 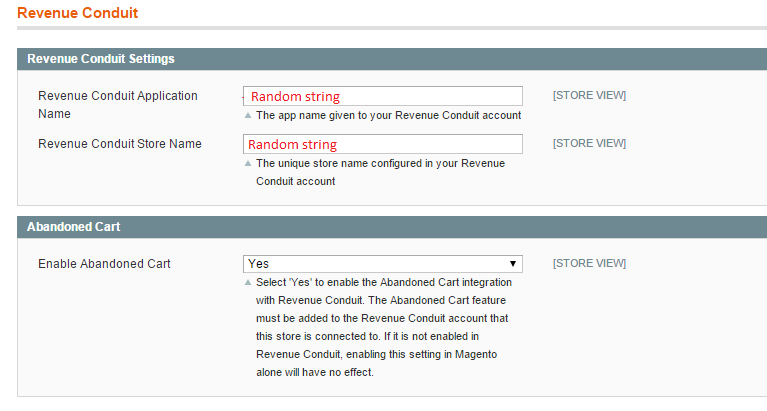 Revenue Conduit stops syncing the data from the store that you have selected above.